Topics: Events, Minutes, Institutions, and Bridging The Gap. It is hosted by Ntt America Inc (Colorado, Centennial,) using Apache/1 web server. ns35b.att-webhosting.com, and ns35a.att-webhosting.com are its DNS Nameservers. 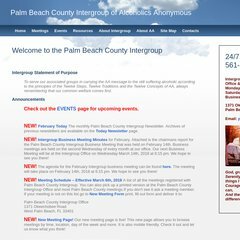 Aa-palmbeachcounty.org's server IP number is 198.104.185.48. PING www. (198.104.185.48) 56(84) bytes of data.